KawaiiPunk - Kawaii Mascot Blog: Zeropumpkin. Deliciously Devilish Dolls! Aaaarrrgh! Well folks it’s that time of year again. The time of year when our thoughts turn to gifts and presents for friends, family and loved ones. And thankfully you’ve got me to help you prepare! Yes, with only nine and a half months left until Halloween is once again upon us, we really should be making plans now if we want to avoid the inevitable rush. What? You thought I was talking about Christmas? I’m the Monster Mascot! 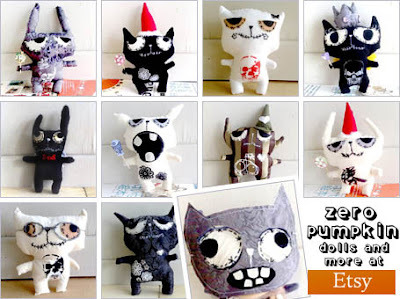 The Zeropumpkin shop at Etsy is the perfect place to make your Halloween celebrations go swimmingly. Their range of devilishly cute dolls includes Devil Bunnies, Zombie Bunnies and, my personal favourite, Skull Cats - diabolically good! They’ve even got paintings and stickers too! So if you can’t pick up your Halloween gifts here, and get ahead of the crowd, I don’t know where you can! Holy Halloween, Batman! I've got to check out this site!